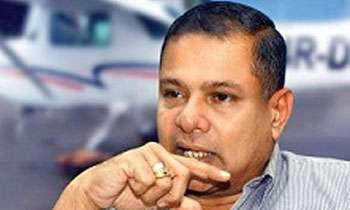 The former minister informed the Commission that although he was the line minister who had to handle the aviation sector in the country, he was not aware about most of the decisions taken by then SriLankan Airlines Board of Directors between the periods of 2010-2015. He informed the Presidential Commission of Inquiry (PCoI) on irregularities at SriLankan Airlines, SriLankan Catering and Mihin Lanka that during the period 2010-2015 the SriLankan Airlines had directly coordinated through the Finance Ministry and the Board of Directors also appointed according to Finance Ministry’s decision. During that time former President Mahinda Rajapaksa was the Finance Minister, he said. When Additional Solicitor General, Neil Unamboowe PC questioned about the Public Enterprises Department (PED) guidelines of appointing Board of Directors to SriLankan Airlines, former Minister informed the Commission that he was not aware about PED guidelines. “There were practices above the law,” he informed the Commission. He said when appointing Board of Directors within the period of 2010-2015 to SriLankan Airlines, he had been not informed by the SriLankan or the government about the nominees for the SriLankan Board, only the appointment letters of Board of Directors were sent to him. “They only sent me the appointment letters and the appointments are made according to the decisions taken by former President Mahinda Rajapaksa. I know that then SriLankan Chairman Nishantha Wickremasinghe was a Planter before he was appointed as the SriLankan Chairman and he was the brother-in-law of former President,” he said. He said that the SriLankan Airlines Board of Directors had not informed him about the five year business plan which created through an international aviation consultant named Via Capital but SriLanakan Airlines had requested USD 520 million to formulate the five year business plan and for the capital infusion by the Cabinet through the line ministry. Former Minister also said that he had appointed an independent committee to inquire about the five year business plan but the committee had also failed to inform him about the plan. He also said that the SriLankan had not coordinated with the ministry about borrowing new aircraft to the company and it was not informed to the ministry. When querying him about the difficulties to handle the Civil Aviation Ministry at that time he said that he had informed twice about the difficulties to handle the ministry to former President’s Chief of Staff Gamini Senarath but he had not received any answer. Oh !!!! He admits that he was just a puppet, while enjoying the perks of a minister. What Spineless parasites. Not only he. Every Minister and public servant were puppets at the time. Dictator Rajapaksa and family ruled. He and cohorts still believe it is right and want to return. During your time there was NO law . Thats why it ran in to Billions of LOSS. So dont try to be TOO smart. Weren't these airlines the private assets of the Rajapakshas? This was the then pathetic situation. All line ministers were only paying worship to the KING. Knowing nothing.Doing nothing. But enjoying all privileges.Funny way of paying tribute for ending war.